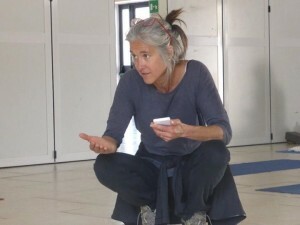 Chiara Ghiron, diploma 500 ore con Antonio Olivieri (Associazione YogaViniyoga) e E-RYT200 presenterà una introduzione al Viniyoga dello Yoga, un approccio vinyasa progressivo basato sugli insegnamenti di Sri T Krishnamacharya e suo figlio TKV Desikachar. Dopo una introduzione teorica all’approccio, le sessioni pratiche proposte mostreranno come vinyasa anche semplici possano avere risultati profondamente diversi a seconda della sequenza e del respiro applicato. I Poderi di Zullo&Apolloni S.S.A. La caparra verrà rimborsata solo in caso di annullamento del ritiro. Chiara Ghiron, 500 hour diploma with Antonio Olivieri (Associazione YogaViniyoga) and E-RYT200 will present an introduction to the Viniyoga of Yoga, a progressive vinyasa approach based on the teachings of Sri T Krishnamacharya and his son TKV Desikachar. After an introduction to the basic principles, the practical sessions will show how simple vinyasas can have a profoundly different effect depending on the choice of sequence and applied breathing modality. hyiheqmrvk Yeezy 2019,Very helpful and best artical information Thanks For sharing. I read this article fully regarding the resemblance of newest and preceding technologies, it’s awesome article. for every person the ads inside the field, bachelorette party? future event or maybe a bunch recreation made for any age. lovers who are seeking a deluxe room equipped for discreet entertainment with a spouse or lover. Texas Hold’em Sites. QQ Online Poker Ceme, the most effective and safest on the internet poker agent site with 1 day IDN Online Texas hold’em service.